With everyone from Jenson Button to Jennifer Lopez doing triathlons, it is no surprise to discover that it is now one of the fastest growing sports in the UK with memberships to affiliated clubs having soared by 50% in the last five years. There are distances to suit all, from the novice event for beginners involving a 400m swim, 10km bike ride and 2.5km run, through to sprint and Olympic distance. Yet the pinnacle of the sport is the legendary Ironman. This involves a 3.8km swim, 180km cycle and 42km run. Or the equivalent of swimming a staggering 152 laps of a 25m pool, cycling the M25 and finishing with a full marathon. 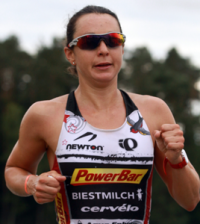 It may sound intimidating but increasing numbers of men and women are taking up the challenge with three time World Champion, Chrissie Wellington regularly beating the race times of male competitors. Fancy the challenge? Here’s what you need to know. Training for an Ironman takes commitment so expect it take a year to prepare for a race of this magnitude. But it doesn’t necessarily mean having to spend hours training every day. When confronting an event of such distance, it is not surprising that many people feed overwhelmed by the thought of training but just keep it simple. “Focus on your weakest discipline, whether that’s the swim, cycle or run,” recommends Gordon. “The other single most important aspect of training is brick sessions, where you tag two disciplines together such as a long cycle, followed by a run. Study the route and terrain of the Ironman event that you enter, as well as what the climate will be when you race. “Recreating exactly what you will be doing in the race itself is the best way of preparing yourself mentally and physically,” says Gordon Crawford. “If the run involves a number of laps, train by doing laps. If you are training for an Ironman you can expect to eat a whopping 3,000 to 5,000 calories. This should be a balanced diet of fruits and vegetables, slow release carbohydrates to keep you going through training, and protein such as lean meats, eggs and diary to help your muscles recover and repair. Lunch: Two wholemeal rolls with salad and chicken. One dark chocolate bar. Mid afternoon snack: Wholemeal muffin with honey. Dinner: Soup. Fish with leafy greens and roasted sweet potato. Ensure you taper your training before the event so you are fresh for it. Don’t neglect your rest and recovery, a vital part of training as it allows your muscles the chance to repair and recover, as well as adapt to the training. What does this mean? Get eight hours sleep and try active recovery such as Pilates, yoga or massage. It has the reputation as being a rich man’s sport with so much kit to choose, from handlebars designed to get you into the most advantageous aerodynamic position, to seamless trainers so you can run without socks to speed up transition times. But you don’t need to spend a fortune. We are running a competition to win a pair of K-Swiss K-Ona S trainers. The new K-Swiss K-Ona S is an Ironman specific running shoe that is built to withstand the rigorous racing conditions of Ironman. Designed specifically for fast days, race days and triathlons, the K-Ona S is very light, extremely well cushioned and supportive, provides optimal fit and comfort, has industry leading water drainage and taped seams for sockless wear during shorter races. 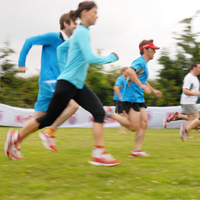 K-Swiss sponsor 12 ironman events around the world, check out the next dates of the Ironman events sponsored by K-Swiss in Europe on our Running Event Tour page. Just click here to enter this competition. Core stability is essential to create a strong structure and avoid injury. Do functional strength work using a cable machines on a Swiss Ball or BOSU. 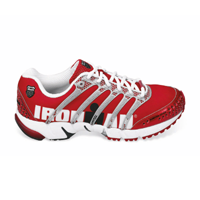 KSwiss is the Official Footwear and Run Course sponsor of Ironman UK. For more information visit www.k-swiss.com.